An alleged gang member said he was at home watching Crimewatch on TV the night a mother and her son, aged seven, were shot in a bungled gangland hit. Jayne and Christian Hickey were shot on their doorstep in Salford in 2015. Carne Thomasson, 28, said he had been watching TV on the night he is accused of calling at their house and speaking to Mrs Hickey, seconds before an accomplice opened fire. 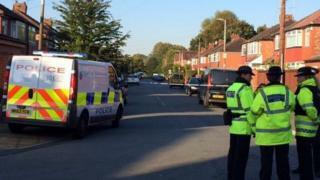 Eight men are on trial over the shootings at Manchester Crown Court. Mrs Hickey and her son were both seriously injured when they were shot in the legs at their home in Winton on the evening of 12 October 2015. She later identified Mr Thomasson as the man who came to her door asking for her husband, Christian Hickey Snr, the intended target. Mr Hickey was good friends with Michael Carroll, who had been part of a Salford gang, the A-Team, but a deadly feud developed splitting the gang into rival camps, leading to a series of gun, grenade and machete attacks, the trial has heard. The boy and his mother were shot in revenge for the "execution" of Paul Massey, a mentor of A-Team boss Stephen Britton. Mr Thomasson, of Doveleys Road, Salford, told the court he was at home watching football and Crimewatch on the night of the shooting at the Hickey's house. Image caption Mr Thomasson admitted being a dealer in "substantial quantities" of cannabis but said he was not a member of a the A-Team gang. He admitted being a dealer in "substantial quantities" of cannabis but said he was not a member of a the A-Team gang. The father-of-one said he knew of the gang name because "the police stirred it up in the media". Four days after the shooting he went to Scotland for 12 days, but told the court the trip had nothing to do with disposing of a car used in the attack, but was to organise a shipment of drugs. He was arrested with a loaded handgun in February 2016 with Mr Britton and others in Marbella, Spain, where the court heard Mr Carroll had fled to escape the "war" on Salford's streets. He said he had travelled to Spain for a fresh start and denied knowing Mr Carroll lived there. The gun used to shoot the Hickeys had also been used six months earlier to shoot Jamie Rothwell, another member of Carroll's gang, at a car wash near Wigan. Jacob Harrison 26, has admitted conspiracy to commit grievous bodily harm to Mr Rothwell on 30 March 2015. John Kent, the eighth defendant on trial, denies the same charge and conspiracy to pervert the course of justice for the Rothwell shooting. Carne Thomasson, Christopher Hall, 49, Aldaire Warmington, 32, and John Thomasson, 49, all from Salford, deny conspiracy to murder and perverting the course of justice. James Coward, 22, Dominic Walton, 26, and Lincoln Warmington, 32, deny perverting the course of justice.